The Strathbogie Ranges were once clothed by tall forests. 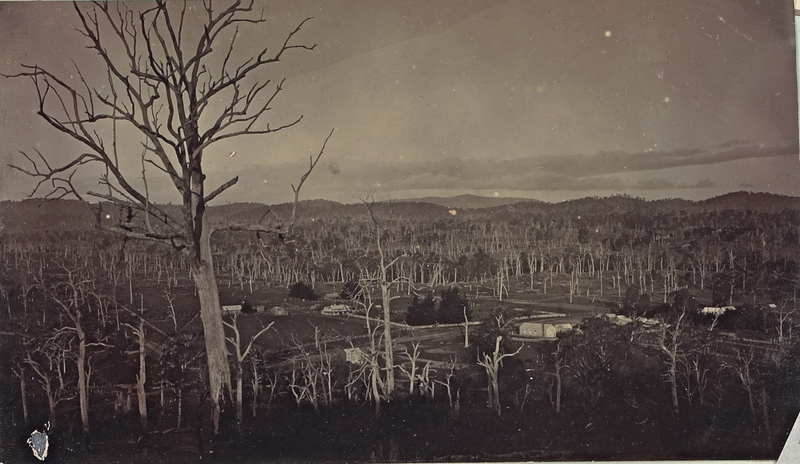 This early image of the township and surrounds is captioned, in the original publication, “An example of over-ringing”. Even at that early stage, some locals thought forest-clearing was excessive. The township of Strathbogie in about 1900; from ‘Early History of Strathbogie’ by J.R. Donald and Mr Vroland 1949. View SE over Strathbogie township from Mt Spy; Mt. Strathbogie on the horizon. Strathbogie township sits on the banks of the Seven Creeks, the major waterway draining the Strathbogie Tableland, an agricultural area of about 15,000 ha lying about 30 km south-east of Euroa, in NE Victoria. Today, the Tableland community is a diverse and vibrant mix that includes farmers, wine-makers, life-stylers, traders and professionals. No one really knows how many people are tucked away up here on the extensive network of dirt tracks and laneways. Some people move up here to get away from the crowds, others get involved in the many community groups and activities active in the district, of which the Strathbogie Sustainable Forests Alliance is just one.